With Expressway and Bus Éireann, getting €20 off your student travel is a doss! We visited College campuses in September and October to dish out free €20 Student Travel Vouchers. Students received a €10 discount off their first journey for travel up to 31st October. If you happened to miss that, don’t worry as you can still receive €5 off when you’re buying any single ticket in November - just enter the code STUDENT51 to get €5 off that ticket. Finally (you seeing how this works yet? ), to get your last €5 off, enter the promocode STUDENT52 when buying any ticket departing between 1st and 13th December – simples! So, whether you’re heading to lectures, home for a few days, or taking a weekend trip with your mates, with Expressway and Bus Éireann, it’s your journey now. Please note, promocodes are restricted to ONE use per customer. Q. Why travel Bus Éireann? Q. How do I buy a ticket? Buy your bus ticket online here or you can also purchase tickets in-station or in participating SU offices/shops. Q. What type of tickets can I buy? Student Weekly and Monthly Commuter tickets are available on Provincial City Services. Q. Can I get FREE student things? Yes! When you join béClub you get 10 points for every €1 spent online which can be redeemed against your Bus Éireann bus ticket, or to enter our great competitions. Join béClub now. Q. What Student IDs does Bus Éireann accept? Our staff attend Student Days & Events on campuses across the country or you can email our Customer Care department. 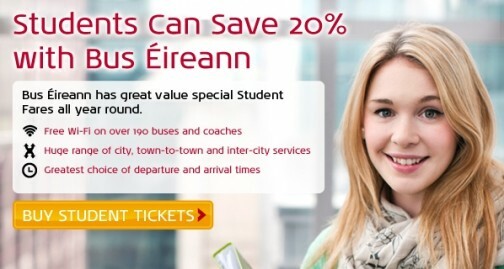 Keep an eye out for regular Bus Éireann student promotions for extra savings. Special Commuter Tickets are issued in Cork and Galway to foreign students participating in exchange programmes for language study. The tickets are only available through the particular school/college attended by the student. These tickets may be issued for various periods of validity which are specified on the tickets at time of issue. Tickets issued in Cork area are valid for travel on city and suburban buses. A separate Photo ID Card is not required for these tickets, but holders may be required to provide suitable identification i.e. Passport, National Identity Card or Student Identity Card. Commuter Tickets issued in Cork, Galway, Limerick and Waterford are valid only in the city in which they are issued. Commuter Tickets must be presented with a valid CIÉ Photo ID Card of the holder with the corresponding validation number entered on the ticket. Tickets remain the property of Bus Éireann and must be produced for inspection at any time during a journey, or surrendered if demanded by any authorised official. Photo ID Cards for commuter tickets are issued at Bus Éireann Travel Centres at Cork, Galway, Limerick and Waterford.